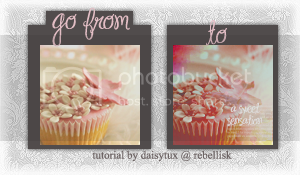 cupcake tutorial 1 - Yesterday I dared to struggle. Today I dare to win. a. As most tutorials start, you're going to pick your base, crop it, rotate it, blur/smudge anything necessary. For this specific tutorial, I'd suggest bases with creamy or pinkier tones. Remember that anything in here is subject to change and up for interpretation, based on your icon. So do what looks best for you. feedback. Just remember to credit the original creator of any texture, if you use one. this is awesome! thank you! i used it on a taylor swift icon that you can find in my user pics. yay! i'm new to photoshop and i love what i got! Oh, that's beautiful! I'm glad you like it!